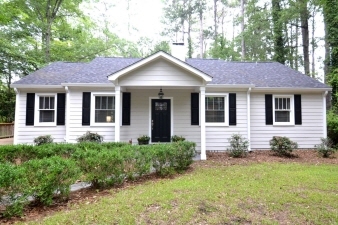 Charming home that is completely renovated from top to bottom in Heathwood! This home has it all! Super open floor plan; Gorgeous Kitchen with custom white cabinetry; granite countertops; gas range; stainless vent hood; subway tile backsplash; stainless appliances; barn door accent for your pantry entrance; and island with bar area for extra seating; lots of recessed lighting; Kitchen is completely open to the Great Room for great entertaining space; Great Room offers vaulted ceilings with beams and skylights that provide lots of natural light as do the double French doors that open onto an expansive deck and huge, very private backyard with firepit area; Master bedroom suite features gorgeous tiled master shower with seamless glass door and niche; raised vanity with dual sinks, granite; separate water closet, and walk­in closet. Refinished hardwoods and beautiful neutral grey walls throughout; True Mudroom and separate laundry room; Formal Living Room with Fireplace & more!! Come see for yourself.